Disciplinary actions or reprimands are unfortunately a part of working in corporate America. Like it or not, there will be times when it’s necessary to discipline an employee, whether for performance issues or behavioral issues. We’re here to make the process as painless as possible. Continue reading to learn when it’s appropriate to write up an employee and what steps you can take to discipline an employee in a sensitive way. What are the steps to discipline an employee? In some cases, verbal and written warnings aren’t enough to create the change you desire from your employee(s). Your organization, specifically the Human Resources (HR) department and involved managers, should have a discipline process in place to address performance and behavioral issues and use these steps to discipline an employee. If you haven’t created a disciplinary process yet, you can create a flowchart in Lucidchart that matches the level of offense with the appropriate disciplinary action. Get started with the template below. When an issue arises, a serious conversation should take place between the manager and the employee. This conversation can take up to an hour in order to ensure the employee understands the severity of the situation. Reiterate the expected behavior or performance, and explain how the employee’s current behavior or performance isn’t measuring up to that expectation. Lay out the facts in a straightforward way, so the employee doesn’t feel that they have been subject to bias, and give the employee the opportunity to explain things from their perspective. Explain to the employee that you have taken note of the conversation and, if the employee doesn’t show improvement, an official written warning will be submitted to HR. The conversation should be documented with the date, time, and location, as well as the topic of conversation and any agreed-upon terms. If the problem persists, conduct a second conversation and fully document the interaction. The employee should be presented with reasons why their behavior is problematic and how and why it is expected to change. Include what the issue is (or what occurred) and ways to fix it. Additionally, you’ll want to include all expectations moving forward and possible consequences for inaction—as well as a clear timeline for meeting the expectations. Provide the employee with a copy of this written warning and provide another copy of the documentation to HR. The third step in an employee discipline process involves asking the employee to leave the office and develop an action improvement plan (AIP) or progress improvement plan (PIP). Give the employee a final chance to step away and reflect on what happened, as well as to decide if they want to make the effort to improve. Review the improvement plan and make changes where needed. If the employee in question fails or refuses to create an improvement plan, take steps to terminate employment. As part of your action improvement plan, you and your employee may want to map out milestones that the employee is expected to achieve. In Lucidchart, you can use a timeline to clarify dates and goals. 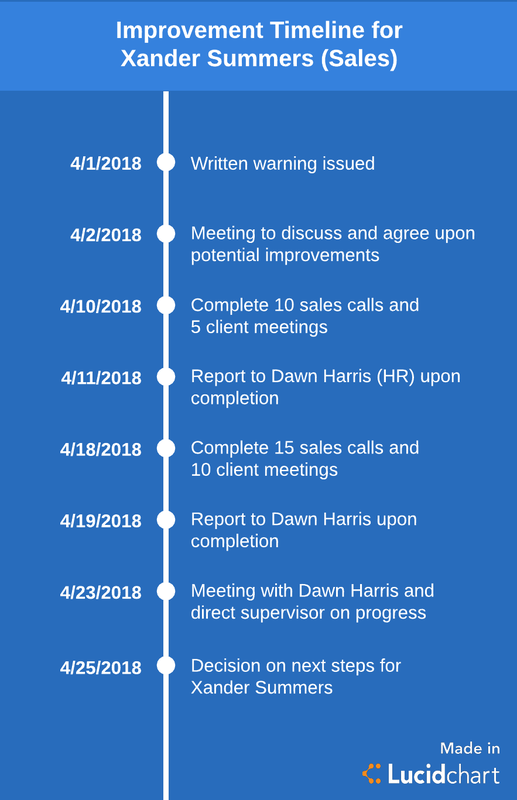 If you have followed the steps above, and if the employee still hasn’t show progress or continues to repeat unacceptable behavior, this final step in the employee discipline process should not be a surprise to any of the involved parties. The preceding three steps require detailed documentation which, in and of itself, should make the case for a successful termination. Additionally, after an employee is terminated, take steps to make sure that you and your co-workers don’t face similar issues in the future. Learn more about the termination process. Minor offenses warrant conversations, restating of expectations and standards, and informal discussions on how to work towards improvement. 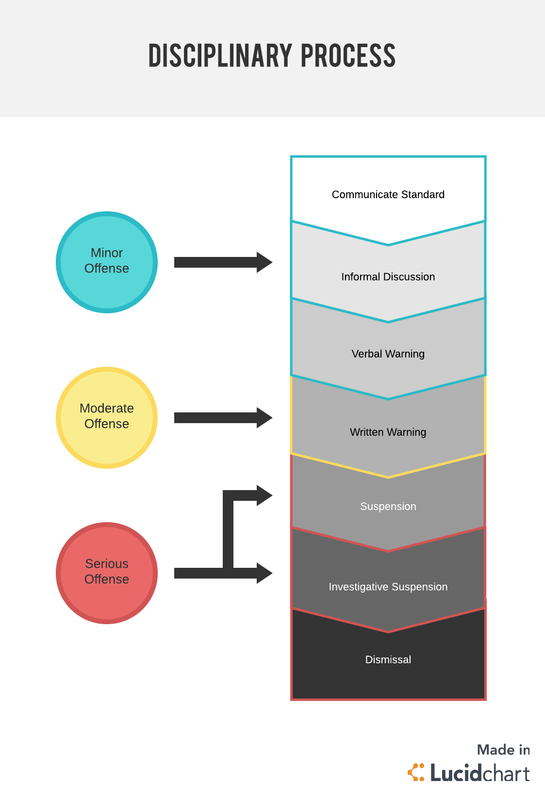 Moderate offenses should result in a verbal warning, followed up by a written warning if improvements have not been made. Serious transgressions can trigger a suspension, and the company’s HR department should conduct an investigation into the action (or actions) that caused the suspension. Depending on what’s uncovered during the investigation, the offending employee may be terminated. No one is exempt from the rules. Behavior that isn’t tolerated from one employee should not be tolerated from another. Apply the same process to every situation, regardless of the position of the employee in question. Back up complaints and issues with specific examples, such as “Marnie clocked out early on August 4, August 18, and August 20.” Without concrete examples of when the alleged behavior occurred, your organization may have a hard time defending their disciplinary decisions. Note the specific policy or company procedure that was violated and include the date and time of the infraction. Do not engage on a personal or emotional level with the employee involved and refrain from drawing conclusions or making assumptions. When possible or as needed, ask the employee to sign the write-up so there is evidence that they were involved in the process. If the employee refuses to sign, make a note of it and get HR involved. Give your employee the opportunity to respond to the actions taken, whether in writing or in a verbal conversation. Document the response. Documentation is key when it comes to disciplining an employee. Use a fact-based approach that focuses on the behavior, not the employee as a person, and record specific examples and instances of inappropriate conduct. The same standard and approach should be deployed across the company. Reprimanding an employee is never an easy feat, but you can require improvement from employees without damaging your working relationships when you set clear expectations for appropriate behavior. Depend on Lucidchart as you develop a consistent process for disciplinary action and employee improvement. Get started with our customizable flowchart.